Club Penguin Cheats by Mimo777 Club Penguin Cheats by Mimo777: I got ZAPPED at the Mimo Tootsville Party! Ok, this new game of Tootsville seriously rocks! Where you there? 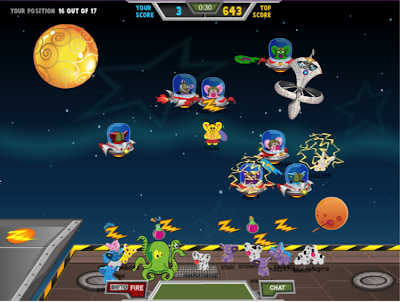 Did you play ZAP ATTACK? It's really fun but really hard. I only got to 4th place. That's as high as I got. The cool thing is, if you can't get in the game to play it, you can also just watch it! Here are a couple highlights of our Tootsville party Saturday. Jack gave away some awesome stuff. And Snowcone replaced jack and the newest famous guy on Tootsville! If you want to play me and think you can beat me on ZAP ATTACK just Twitter me and I'll try to meet you there and play you! awesome! but i dont have an acount. it sounds cool though! cool! im in that picture! awesomeness! oh yeah btw thx for making me a mimo mod! and congrats to everyone for being a mod! mimo!!! !shade has snowcone! !i just saw it myself! !meet him tommorow at 7:40.we will win!!!! sweet party I dont have one but i realy want to meet you mimo you are awesome. WARPED! Not weird! Well, I guess you could say weird..but in a GOOD way, right? Not like other people I know! Mimo thanks for making me a CPG MOD. I will do my best! Hey justin619! Please don't put (CPG MOD) after your name unless you're modding! :-) BTW... what do you mean by "i don't have one" one what? Tootsville account? 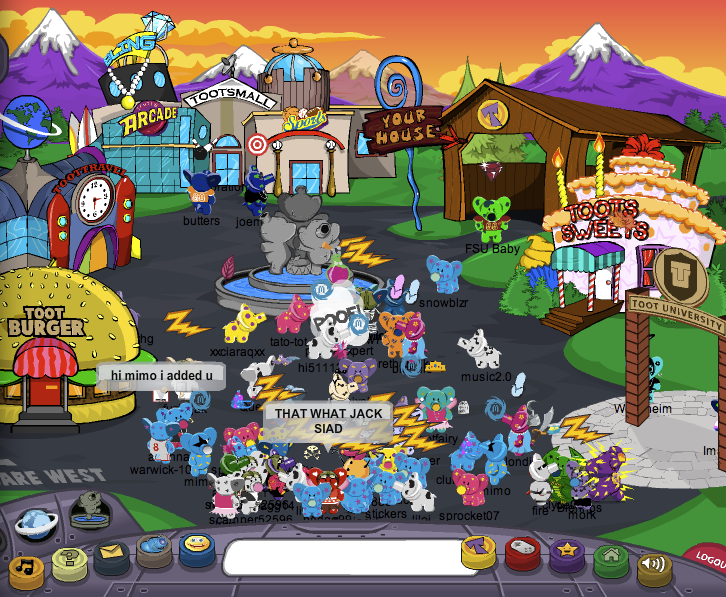 Cuz I met Mimo on CP and he added me on Webosaurs! Mimo IS awesome! Hmmmm...... I don't play Tootsville musc, but that seems pretty cool! I might be there! Thanks! 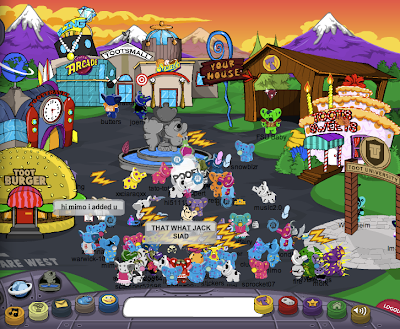 I made an account but I couldn't find the zap attack game? Anyone know were it is? It's at the Moon Base T, but you have to be a VIT to play! I got on there, and got upto the 7th place after 5 tries. It was really hard. Travel to moon base T and its on the to the far left. Hope this helped! and I got zapped a million times. Yay! Mimo adds Mimo and Mega Mimo Mods now! Mimo! Remember last night when you added freddyp9, sklooperos, and Happywagon? Well, did you see Frog1553? He was my brother! I saw you last night Mimo! MImo! U forgot to come on last night! Guess wat happened!Ok So Snowcone was at the joke contest with us and Shade came! But thats not all, SHADE TOOK SNOWCONE!Then jack came back and tried to get him back, but we couldn't. Shade said he'll keep him for 24 hours, then feed him a dark dark for breakfast.I think a dark dark turn him bad too! So Jack said to make a plan and meet him in toots square at 7:00 central time! IDK wat will happen tonight, but u gotta be there!We ve got one day to save snowcone! Congratulations on Marquizi98 for getting upgraded to Mimo Mod! He is one of my best friends on here so Im pleased for him. I bet hes pleased too because he has been waiting patietly for the mod upgrades, and was really excited. Thanks mimo for making him happy! I CAN SEE YOUR BLOG ON MY DSI!! AND WHATS EVEN COOLER IS THAT IM POSTING THIS COMMENT ON MY DS!! I agree Z! Congrats to Marquizi! Srry, I'm sure you'll be a mod next time if you work hard at it! Try to make the mod list next time Mimo updates. comment a lot and answer questions! I fint the tootsville map har to use too! Yeah shade took snowcone last night. gook luck with getting him back! Cool!!!! I always wanted to be in one of mimo's pictures. And i've seen you on the mod list and CONGRATS!!!! I want to be one! And yeah congrats to everyone being a mod! Hey thanks for the message on the other one! And thanks for the tips like (CPG Mod) not the other one! And we should be great Mod buddies! Keep up the great work!!!! I got up there, and got upto the 7th place after 5 tries. It was really hard! CONGRATS!!! I dont play Tootsville though. but if you say its hard I 100% belive you!! Still congrats to making to to 7th (!!!!) place!! Well CONGRATS Ponchee! I've never played Tootsville before though. 6th place is REALLY good!!! and I got zapped a million times! Nice! ...well i guess its not that nice...but it is great that you got 6th place!!!!! You did an amazing job!!!! MIMO GUESS WHAT?!??? I CAN SEE YOUR BLOG ON MY DSI!! aND WHATS EVEN COOLER IS THAT IM POSTING THIS COMMENT ON MY DS!! AWESOME!!! I've always wanted to try that. I have a DS but not a DSI! AWESOMENESS! Well have fun commenting on your DSI! Cool, and of course there will be a next time where you can try to be a mod again! Go for it! I believe you! I've actually posted on my blog from my nintendo DSi AND My Wii! Cool! Overall? Cuz that's REALLY good! Congrats pal! No problem! 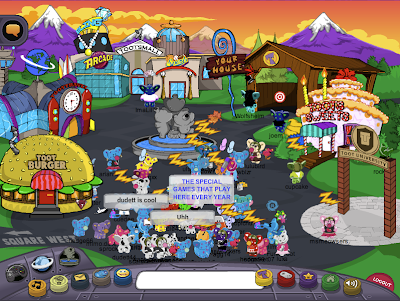 Hey, do u wanna meet up on CP sometime? We can b buddies!